Hoi Duong has a fuzzy snooze alarm. When she snuggles under the covers to catch a few more zzzz’s, her kitty, Pumpkin, goes into action. He nuzzles her face and rolls around on her. For good measure, he licks her face with his scratchy tongue. Hoi has no choice but to give in and get up. 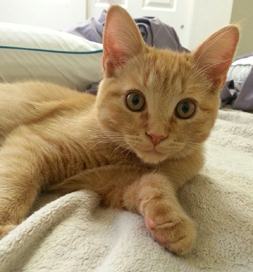 Pumpkin is ready to leap into action, bringing lots of laughs to his new family. When Hoi and her partner moved to their current location in Bellingham, WA, they began longing for a cat. They found Saving Pets One at a Time (S.P.O.T.) of Burlington, WA, on Petfinder and saw photos of three adorable kittens that seemed perfect, so they went to meet them. While there, they noticed another little kitty that was rather withdrawn and they felt sorry for him. “He was by himself because his sisters had been adopted as soon as they were available,” Hoi says. Once out of his cage, he wasn’t withdrawn at all. “He was climbing everywhere! He was big enough to jump onto the metal doors; he looked like a little monkey,” she says. Hoi was worried about the cat’s high energy, but her partner was adamant about not leaving without him. “So I caved,” she says. They named him Pumpkin. She’s glad they worked it out because “he is the absolute most loving cat and gives us a lot of love and laughs,” she says. “He loves to climb, kick and get on his hind legs to box with his front paws.” And she now cares for him deeply, even when he’s being a pushy snooze alarm.